It has become an American icon--Disneyland (or Disney World). Even budget conscious large families often plan at least one trip to a Disney property. It's magical. It's memorable. 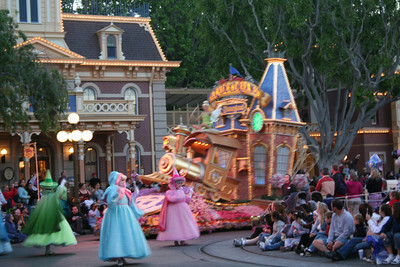 Parades, Fireworks, Rides, Characters that come to life. It is also long lines, long days, and quite a blow to the bank account. Entire books are devoted on how to beat the lines, the heat, a cranky toddler, etc. And I recommend you read one before going on your trip. But to get you started, here are my 5 ideas on picking the right the tour for your family. For some families, Disney is all about the rides. 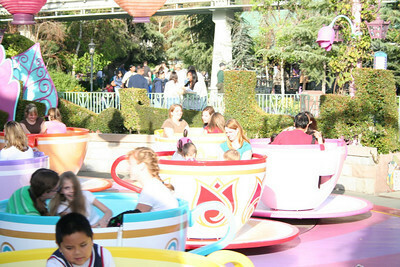 And lets face it, some of the rides are pretty spectacular and unique filled with the latest in Disney technology and magic. If your family's primary goal is the rides, then you need to follow a few simple steps. Tour off season and in the middle of the week. Get to the park before it opens so you can park and go through security. Take advantage of fast pass. Did I mention you need to take advantage of fast pass. Eat before normal meal times. Ride lines go down during the parade, so be sure to hit major attractions then. Consider touring during slow holiday times when few if any rides are closed and some rides like Its a Small World and Haunted Mansion are in unique holiday splendor. For the left side of the park, go straight to Splash Mountain and work your way back to the main gate. For the right side of the park, go to Star Tours first and then collect fast passes for the other major attractions while enjoying Fantasy Land. Then use the fast passes in the afternoon. As new attractions open each year, be sure to read the current year edition to ride beating books. Also, you will want to download an app that lists wait times. Expect a very rushed day and long hours but multiple rides (maybe even your favorites more than once). 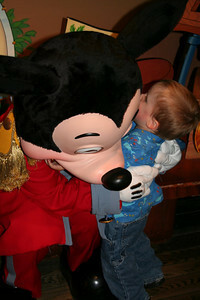 If you child is there primarily to meet their favorite Disney characters, here are a few tips. Characters hang out in the main square frequently at the beginning and ending of each day (at Disneyland) and throughout the day next to the Bug'a Life theater in DCA. Feel free to hop the train first thing and go to Toon Town to meet Mickey and any other characters who might be about (often Pluto, Minnie, Goofy, Donald, Chip and Dale). Other characters have scheduled locations--most notably the latest princess is stationed in Fantasy Land (often an hour wait so get there early) and Mickey in his house in Toon Town (wait times vary by season and day). Be sure to check out the flyer at the beginning of your day to see if any other characters are scheduled for a meet and greet. The real bang for your buck is the character dining. I have written entire blog posts on how to eat for less on vacation, so when I saw the price for character dining, I almost passed. I am so glad we didn't. It was money well spent. Because we get free breakfast at our motel, we did Goofy's Kitchen for dinner. The cost for my family of 7 was $175 including tax and tip (Costco occasionally offers discounts) and that provided us a complete buffet with both adult and kid friendly food (pb&j pizza). We leisurely got to meet 7 characters including photos and autographs during our 2 hours of dining. They had two mini-dance parties where are 7-year-old entertained the restaurant by break dancing. If your child wants to meet a specific character, feel free to ask your waiter. If you have little girls, the princess lunch at DCA is a must. Be sure to have your autograph books and cameras ready. We found buying our 7-year-old an official book to be a good idea. He drew each character next to their autograph and plans on turning it into a scrapbook. Fortunately, he had the characters sign every other page. His prized autograph--one of the army men from Toy Story 3 that was performing a drum number in the street. Disney has changed significantly in the last few years. Downtown Disney now offers more variety of merchandise then the parks. Consequently, after hunting through the parks for a few items, we ended up finding them easily at 11:00 pm on our last night in the downtown district. Serious shoppers should still check out the Star Wars store and New Orleans Square within the park. Don't forget to check your receipt for coupons often good during morning hours only. Meanwhile, the Downtown district offers an impressive Lego store, crystal shop, large emporium, build your own remote control race car, Build-a-Bear, Disney 365 (for tweens including make-overs), beignet shops, and so much more. Be sure to plan at least a couple hours here for the casual shopper and a whole day for the serious shopper. My husband's favorite part was the Best Buy kiosk that sold all sorts of electronic products including a juice pack for the iPhone. It is impossible (or nearly impossible) to do and see everything. The restaurants, rides, shows, playgrounds, and parades are very diverse. During our trip, lines were short to nonexistent (often less than 5 minutes) and we were at the parks for three days for a total of 37 hours plus another 6 hours in the downtown district. We still did not go on every ride and we certainly did not get to sample all the cuisine Disney offers. For families that want to balance the attractions, dining, character greets, shopping, fireworks, etc, my best suggestion is to get a map and let each person in the family circle two rides (three if you have a small family) for a total of around 10 rides. Then do the rides in order (clockwise or counter clockwise), give yourself time to watch a show or parade, shop, meet Mickey, and catch the evening fireworks and Fantasmic or World of Color shows (the evening shows are worth your admission ticket alone). Include a character dining experience and you have a good 2-day Disney trip planned with a little of everything without too long of days or too rushed of a feeling. Especially if you have a large family, you may want to split up for all or part of the day. A tween may find two hours in Fantasy Land to feel like a jail sentence. Similarly, a toddler that spends hours in his/her stroller while older ones ride roller coasters will be equally bored. Splitting up can make everyone happy and then you can meet back together for parades, shows, family rides like Pirates of the Caribbean, or to switch the parents. Similarly, groups can split up briefly. For example, older kids can go on Splash Mountain while the little ones ride adjacent Winnie the Pooh or older kids can go on Star Tours while younger ones ride neighboring Buzz Lightyear. What Disney Tour is Right for You? One of the reasons that Disney is so enduring and magical is that it offers something for almost everyone. Just spend five minutes looking at all the famous mouse ears to choose from--R2D2 ears, wedding ears, pirate ears, classic black ears, holiday ears, princess ears, baseball hat ears, mad hatter hats, and on and on. So figure out what type of Disney experience is right for you and then plan your vacation with that in mind. On Main Street at the Abe Lincoln theater is a model of the original park and footage of some of the rides including a live mule ride now replaced with Thunder Railroad. Amazing to see the changes over the years.